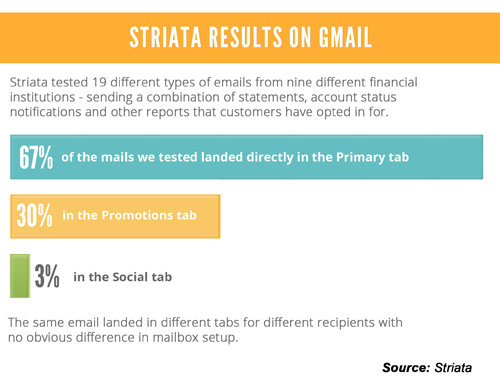 Striata Spotlight News Are your emails still reaching Gmail users? Email billers and marketers have been spinning since Google announced the introduction of tabs to Gmail inboxes. The objective is to make it easier for the user to de-clutter their mailbox by moving certain message types (promotions and marketing messages) out of the ‘primary’ inbox. “All messages are affected by this new system, so any business that sends bulk communications to customers who use Gmail, needs to consider that their potentially critical messages might not be landing in the primary inbox at all.” says Michelle van den Berg, head of eBilling at Striata. Van den Berg stresses that it’s not just about wanting business emails to land in the primary inbox (although that is preferable). 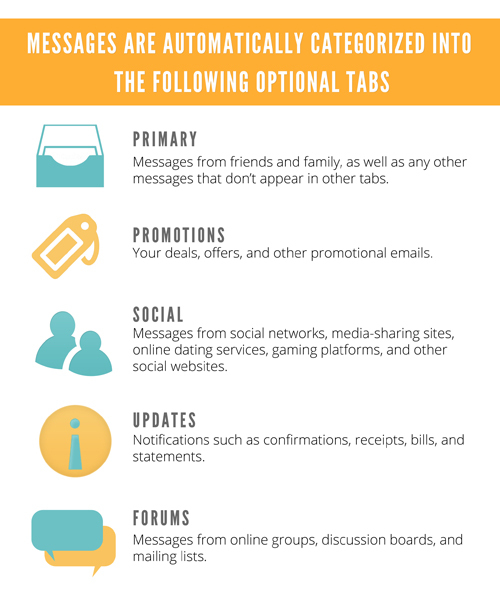 If a message is relegated to a secondary tab, the recipient may not receive a pop-up notifying them of the email’s arrival especially if using a mobile device. “Whether it’s a time-critical notification, a marketing newsletter, or an invoice – we wanted to know how Gmail would route these messages. Especially considering that in one of our top industry sectors – financial services – we estimate Gmail users make up 5% of recipient databases (South African senders),” says van den Berg. In a June 2012 blog post, Google revealed that Gmail now has 425 million active users globally. “No matter how you look at it, Google’s tab approach will impact email marketers”. The objective was to see if there were obvious steps a sender should take to improve their message delivery to the Primary tab. Mobile device users: request that your customers actively move time critical emails such as notifications to the primary tab if they want pop-up notifications of future emails. Specifically if they are using the mail for notifications of transactions on their bank account. Try to start a two- way conversation with your customer – ask them to reply to the email and consider incentivising this on a regular basis to cement the two-way conversation and thereby get your future emails into the Primary tab. “I plan on providing further insight into the methodology of what we considered and tested during this exercise in my next blog post,” concludes Van den Berg. If you aren’t subscribed to the Striata blog, you can register here.